Ad Clerum WordPress SEO Theme version 3 was last tested on WordPress 3.1 and no issues found. Update June 2014, the free Ad Clerum AdSense WordPress theme hasn’t been updated for around 6 years, have no plans to update it in the near future. If you are looking for a free AdSense WordPress theme use the Talian 5 AdSense theme, looking for a WP theme with AdSense, Chitika, Kontera, Infolinks and custom ads built in, plus awesome SEO features see the Stallion Responsive Premium theme (not free). Consider Ad Clerum as an archived WP AdSense theme, will probably have issues with latest version of WordPress. This quite dark WordPress theme caught my eye while I was looking for the next WordPress theme to convert to AdSense/SEO, a new theme created just this month it can’t have much of a user base yet, (might never be popular) but it’s layout reminds me a lot of the Talian WordPress theme and I like Talian a lot, (use it on many of my own sites) so decided this would be my next WordPress theme conversion to AdSense/SEO. The original Ad Clerum theme is designed to be used with religious/church web sites, but I think it could be used on literature/writing type sites just as easily (I’ve already using it on half a dozen of my sites). The original theme designer made the Ad Clerum theme extremely wide, (must have a huge monitor) I use a 19″ monitor set to 1024 x 768 resolution, even so when maximised in Internet Explorer and FireFox it still resulted in a scrollbar along the bottom! I hate to see horizontal scrollbars when browsing a website, let alone a maximised browser so have reduced my AdSense/SEO version of Ad Clerum in width (under 900px now) so it comfortably fits on my monitor without the need for maximising (now it’s a little narrower than the Talian theme that you can see on this site now). This means all your content/menu is seen and so is your sidebar ad unit. Like all my AdSense/SEO WordPress themes I’ve added many new features not always found in the original theme. You can see the Google AdSense ad units in the Ad Clerum screenshots below, a 250×250 ad unit that floats to the right at the top of the content of the first post ONLY, a sidebar ad unit 200×200 (quite a wide right sidebar on this theme) and a bottom (not quite footer) AdSense ad unit 336×280. 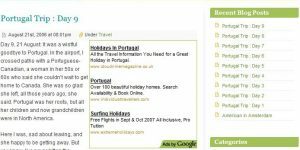 The first screenshot of the Ad Clerum AdSense + SEO theme shows the single post page format (home page format is very similar). You can clearly see the floating first post AdSense ad unit. 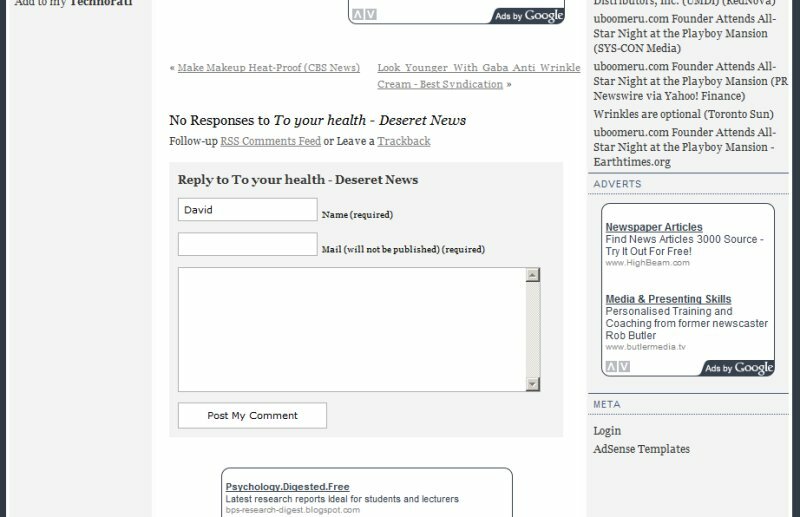 The second screenshot shows the bottom of a single blog post page using the Ad Clerum theme, you can see the bottom of floating ad unit again, the sidebar 200×200 ad unit on the right menu and the top of the large 336×280 ad unit at the bottom under the comments form. All these ad unit sizes are changeable by you through editing one file (full easy to follow instructions are included with your theme purchase). 1. Unzip the Ad Clerum zip file. 2. Edit the file adsense.php within the /ad-clerum-adsense-seo-03/ folder to include your Google AdSense code (read the readme.txt file for more details, very easy to do). 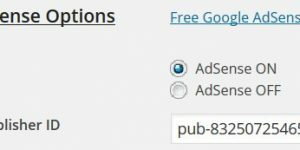 Note: Adding your unique Google AdSense publisher code (your pub-##### number) is the ONLY required change needed to the entire Ad Clerum AdSense + SEO theme to make the theme ready to turn your WordPress blog into a Google AdSense residual income stream. 3. Upload the entire /ad-clerum-adsense-seo-03/ folder to your WordPress themes directory (via FTP, just like any other WordPress theme you’ve tried). 4. Log into your blogs dashboard and under Presentation select the new “Ad Clerum AdSense + SEO 03” WordPress theme and you are done. The Ad Clerum AdSense + SEO theme out the box uses blended ad unit colours and large ad units for maximum CTR/AdSense revenue (like all WordPress AdSense themes on this site). If you wish to change unit colours and/or ad unit dimensions this can be achieved by editing just one file (adsense.php). If you don’t like the 250×250 sized ad unit for example, no problem a few minor changes and you could have a smaller 180×150 ad unit. Don’t like image ads, again no problem specify text only ads. Also checkout the /alt/ folder where you will find an alternative adsense.php file that uses smaller ad unit sizes (try it out, see what you think). WordPress Tag compatibility – tags added in WordPress 2.3, many old themes are incompatible with tagging. I also add tag compatibility in a way that is backwards compatible with earlier versions of WordPress (pre 2.3). If you’ve ever tried a WordPress theme with tags that works fine in 2.3+ in an earlier version of WordPress you’ll find it breaks WordPress. With some nifty coding I solved that problem for all my themes, so my themes work with WordPress 2.0 for example (tags are turned off in early WordPress versions). Widget compatible – works perfectly with the new built in widget editor added to WordPress 2.3. Targeted Google AdSense Coding – your ads should be more targeted to your content, not menu items. Very Rounded and Slightly Rounded AdSense ad unit borders – more options for how your ads looks. SEO Optimised code – I’m an SEO consultant, so everything I do is SEO’d. Optimised headers, (H1, H2, H3, H4) for example on blog post pages like this one the name of the blog is NOT within a H1 header, (every WP theme I’ve used has a H1 header that holds a link to home page). Instead the title of the post for Ad Clerum theme users is within the H1 header and the link to home is only a H1 header on pages that lack a true keyword focus like the monthly archive pages. 90% of WordPress themes use H2 headers as menu titles, a big SEO mistake. You won’t find any wasted headers in this theme. Optimised anchor text of text links. I’m just starting with Ad Clerum and am having problems with widgets. It seems the widget editor is unusable. No widgets appear in the Sidebar editors on the Widgets page but do on the blog. If I try to add to widget I loose the standard sidebar functions that are coded into the left.php and right.php files. I guess I am not understanding something or other. I’d appreciate it if you could take a look. Resolved, I think! I guess I just have to add the widgets that I want and they overide the sidebar php files. That’s right, as soon as you add a widget what was on that sidebar is removed. You then add exactly which menu items you want. When adding widgets try to aim for the ones with GAT in the name before using the default widgets. The GAT ones are specifically for this theme. Can you tell me why, whatever page I set for my Front Page, Google Ads show blogging and wordpress ads. This is also the case if I set my latest post as Front Page. Every other page (and posts) picks up my Slovenia content perfectly. Not unusual to see unrelated ads at first especially if this is the first time the sites had AdSense on it. It’s a WordPress blog so not surprising if the AdSense bot hasn’t decided what a page is about it will default to blog like ads: you have a blogroll, rss feeds, comments and of course in the code references to WordPress (not sure if AdSense looks at where the template files are located) all suggesting your site is a blog. Give it time and it should improve, but don’t be worried if a few ads still don’t make sense as some advertisers do blanket type advertising and will take any traffic (basically very, very cheap advertising). Actually I’m amazed at how quick Google displays relevant ads – its immediate for all my new posts. Does the Adsense bot read the URL, as the only page/post that does not have the right ads on it is the Front page, no matter what content I put there? For example, my sites home page has poor ads, whilst WordPress posts has good Adsence ads relevant to the niche. I guess this is a WordPress issue and not the theme. Love the theme by the way. Very happy with it. 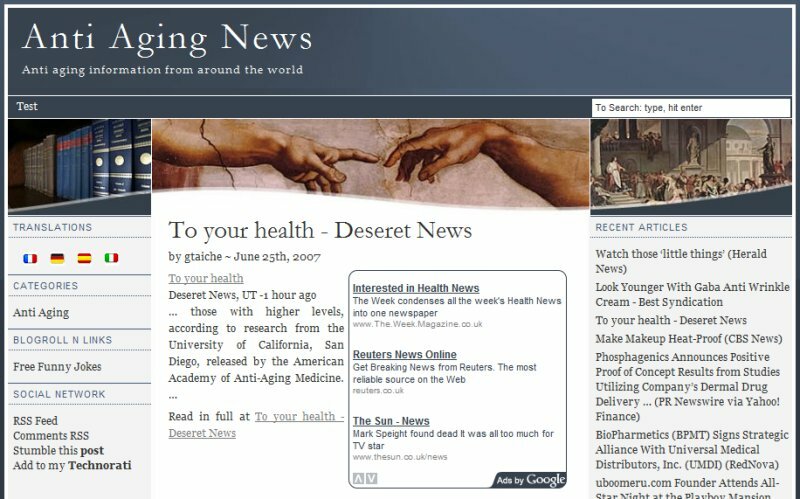 Like you I’ve noticed a tendency for the home page of a new WordPress site or one with AdSense just added to have less relevant ads than deeper content on the same domain. I’m not sure why that is, I’ve put it down to what the AdSense bot saw when the first AdSense ad was loaded on the home page for the first time. So if you installed WordPress and you get the Hello post mentioning WordPress, you are going to get WordPress ads. Add to this the Blogroll I mentioned before and it makes sense. Look at your default About page to see what I mean. The bot has to spider a page just like GoogleAdbot (their AdSense search robot) and that takes time (it’s not instant). If you update your About page today the bot has to come back a respider/index it, in the meantime you’ll get Blog type ads. I’ve been using Ad Clerum for a while now and switched over to your Adsense version. Do you have a version of Seo Super Comments for the Ad Clerum Adsense Theme that fixes the title issue. I had no problem getting the plugin to use the post tags for keywords, but I can’t wrap my head around changing the meta title.